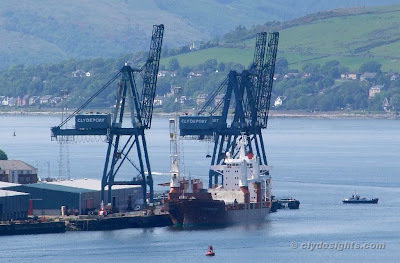 Loading paper reels for export to the USA at Greenock's Ocean Terminal on Sunday afternoon was Spliethoff's SLUISGRACHT, a ship dating from 2001 when she was built at Sczcecin in Poland. She has a deadweight of 21,402 tonnes, and is 172.6 metres long. Just beyond her is Clydeport's CLOCH, which had just left the small boat harbour. She is currently deputising for one of the regular pilot cutters.